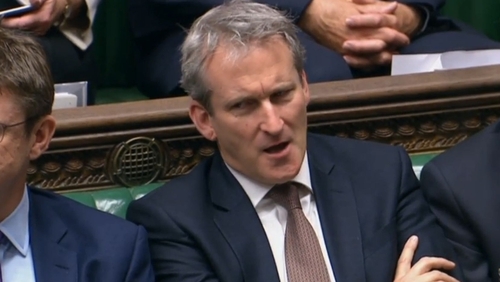 British Education Secretary Damian Hinds has told RTÉ that holding a second referendum on Brexit would be "seriously undemocratic" and "would likely produce the same result". Speaking on RTÉ's This Week programme Mr Hinds said British Prime Minister Theresa May would be going back to Brussels on Tuesday for further negotiations on the withdrawal deal and future relationship, ahead of next Sunday's EU council meeting. Mr Hinds said that "nothing is agreed until everything is agreed, and until the final signatures are on the document there are always discussions to be had." He confirmed that the backstop had led to passionate discussion inside the British cabinet. Mr Hinds said hardline conservatives and the DUP needed to consider the alternatives to the deal. "It's been at the heart of the Prime Minister's approach to ensure the integrity of the United Kingdom and to make sure there is no return to a hard border between the Northern Ireland and the Republic. This deal does deliver that," he said. On a predicted no confidence vote in Mrs May, he said many people expected the 48 letters needed to trigger a vote would be gathered by now but it appeared they had not been. He said the majority of his colleagues have great admirration for the prime minister. "There are difficulties but she has shown remarkable drive and resolve". Earlier today, British Labour Party leader Jeremy Corbyn said that he believed another referendum was "an option for the future" and "not an option for today". Asked on Sky News if he would support Remain in a second referendum, he said: "I don't know how I am going to vote, what the options would be at that time."